Regis Today is the bi-annual magazine of Regis that features stories on alumni, donors, students, and friends of the university as well as class notes (in fall issues only) and alumni photos. 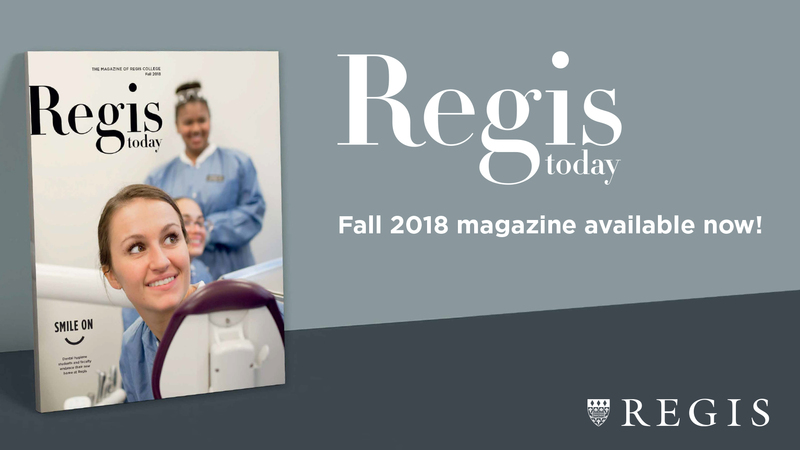 Recently published issues of the Regis Today magazine are available to view by clicking on an issue link below. If you're not receiving the digital magazine via email, make sure your contact information is updated. If you are a Class Reporter, visit the class notes page for more information. Grace Milner Howard-Donlin ’00 founds an inner-city honors academy that challenges the status quo. When Mount Ida College announced that it would close its doors in spring 2018 their Dental Hygiene program was left without a home, without educational pathways and without jobs - until Regis committed to continue the program. Looking to submit class notes for the next fall issue? Submit a class note to us.